Discussion in 'CPUs' started by Nelly, Oct 16, 2018.
the problem was getting the heat from the die to the IHS, if you direct die then the problem is getting the heat from the die to said cooler, the problem still exists. this is why i thought it was a thing of the past. Direct die cooling a 9900k gains you between 4c-8c, this is what I had on my previous 9900k compared to non delided temps. after delidding what TIM did you use? refer to my last post.. I previously mentioned Standby Voltage in this thread so I want to give an update regarding it. On the Maximus XI Formula leaving it on auto and exceeding a certain voltage or frequency would push the standby voltage much higher than the default 1v (ish). The same behaviour occurs with the Maximus XI Extreme even when LN2 mode is not selected. After some searching I found a post from Elmor stating that the standby voltage changes above 5.2GHz (?) according to a rule in the bios that informs the auto setting. He states that the increased voltage should be fine for benching. While I can see the question asked about whether or not increased standby voltage is fine for 24/7 overclocks I can't see an answer from Elmor about it. I'm going to continue searching for the answer to this and setting the standby voltage to 1v manually until I've determined that a higher voltage is safe when not using exotic cooling. I thought the 9900k used solder?? Set both PLL Termination and CPU Standby to 1.1v and forget. It does, but I don't see your point ? So why would you delid it? (and how!?) I've seen Der8aur delid ryzen (not easy) and liquid metal it and it made literally no difference because it is soldered in the first place. Dellidding is only worth doing for toothpaste chips. Thats cool. Kindof crazy that even with solder this is "worth doing". I thought it was just intels toothpaste that was a problem. Can you lap the die or is that just madness? Some people lap the die. Beware though, my previous 9900K died a few weeks back, I must have damaged some of the traces on the die when removing the solder, the IMC was never the same afterwards, and it died completely a few weeks after. My new 9900K is just as good overclocking wise, uses about the same voltages, but the thermals are slightly better on my new one, so wont be Direct die cooling this one, no need. Oh don't worry, you wont catch me delidding a CPU any time soon. Too risky for me. I'm in my 30's so I am currently throwing all my cash at my mortgage, so don't really have much disposable to risk it. Maybe in the future I will experiment more. I've made some changes to my setup since the screenshots i posted last. Okay, I finally pulled my finger out and uploaded some images. 1.128 was the lowest vcore I caught in a screenshot but not the lowest I observed. 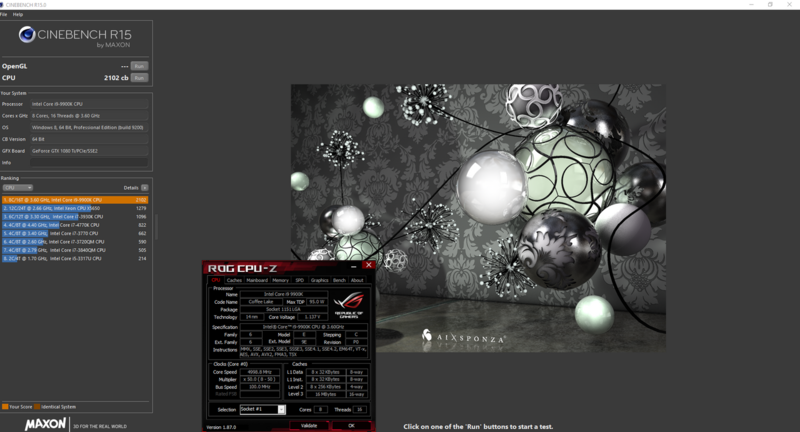 The score on this one is quite low because I had other things running in the background while benching during the 5.2GHz run. All runs were back to back and with an ambient temp of around 18 degrees ish. I've got my GPU on a separate loop and when I have enough fans I am going to be adding a MO-RA3 as an external radiator to the CPU loop. 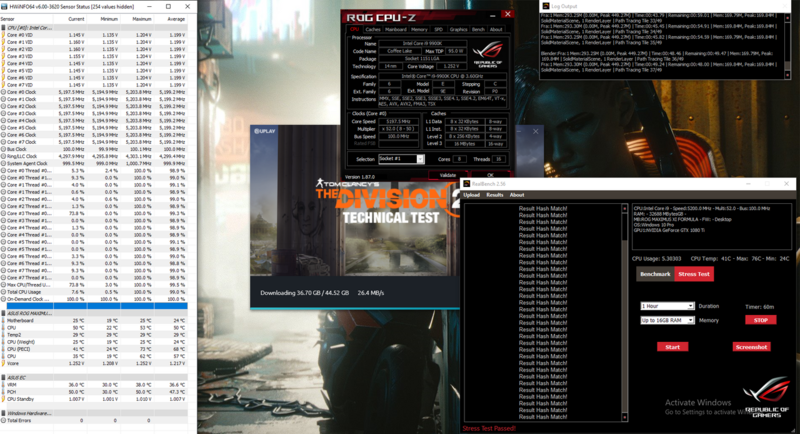 Some of the runs have lower than expected scores in Cinebench and this is due to other things going on in the background while I was benching. I only have the one PC and not a great deal of time so I have to multitask, sorry about that. I may revisit this and update the scores if I begin tweaking the RAM and working on lowering the vcore for a given frequency. 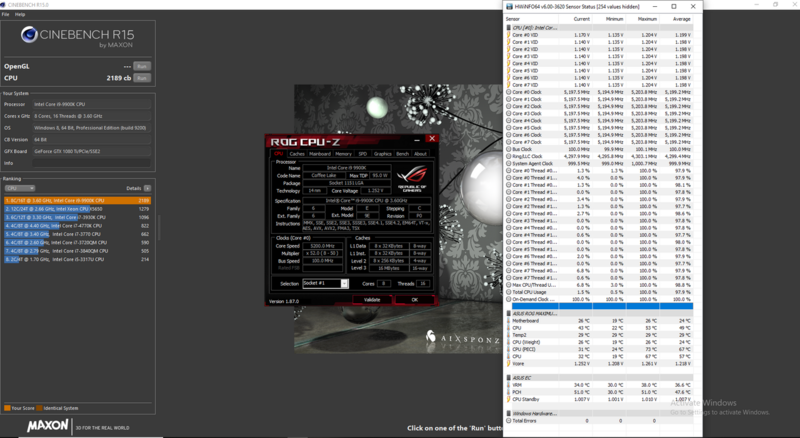 I can run Realbench at 5.4GHz but it starts giving WHEA errors, you'll see that all my screenshots include HWinfo to show that each run was WHEA error free. I 'think' I am at the limit of the board now in terms of power delivery, or perhaps my loop is at the limit in terms of heat but I am not going to try overclocking at below ambient. 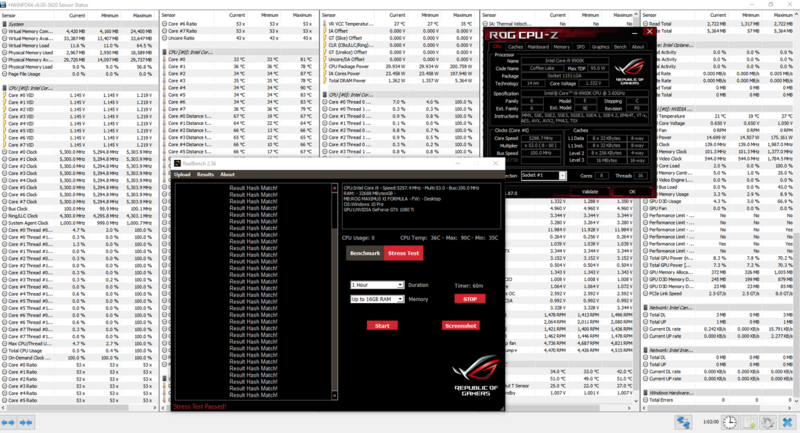 For what it's worth, the VRMs on the Maximus XI Formula peaked at 42 degrees during the 5.3GHz 1hr Realbench run and don't go higher for 5.4GHz Realbench so I think they are doing fine. Even if the temp sensor is inaccurate and is reporting something crazy like 40 degrees lower than the hottest point I'm still well within the spec. The CPU block is still the EK Velocity. Now mounted upside down (not goofy) with long M3 screws. 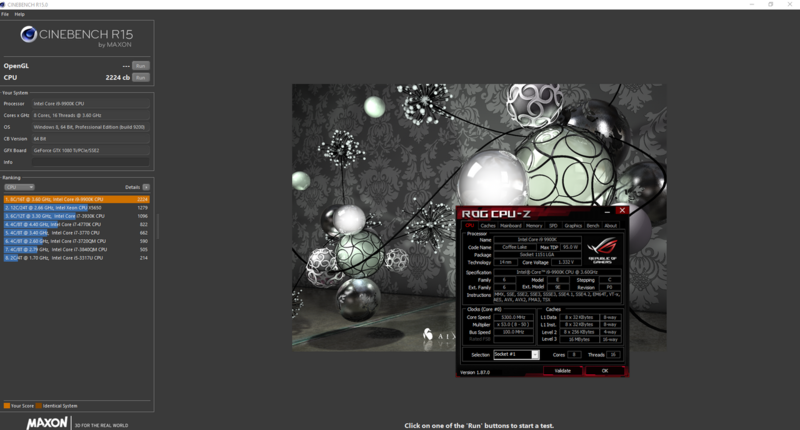 5.4GHz 1hr Realbench stable, no AVX offset, no chilling of the loop. No WHEA. Also stable in Apex legends, Div 2, Overwatch etc. Temps at idle/browsing are 30s and temps while using the machine for more demanding tasks are 40s. I don't know what it is that has changed, or whether it is the combination of all the recent changes I listed above, but temps on the core are much, much better now. So much better than they were previously. The difference is huge. 1 hour run of Aida64. 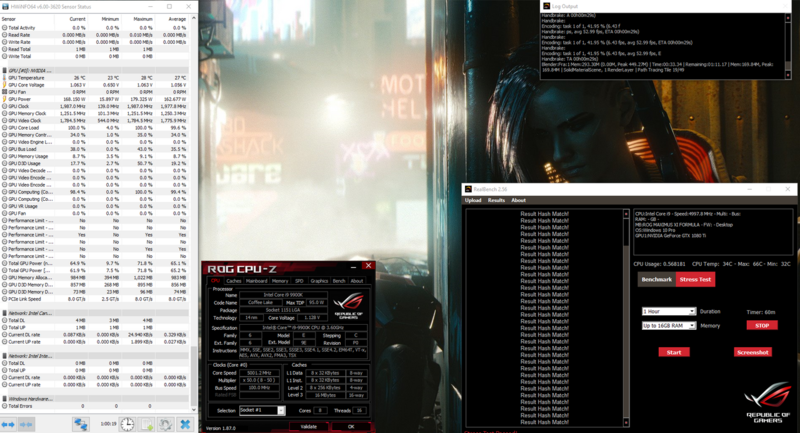 5.2ghz, vcore 1.285v and LLC7 in bios, load voltage of 1.243v. 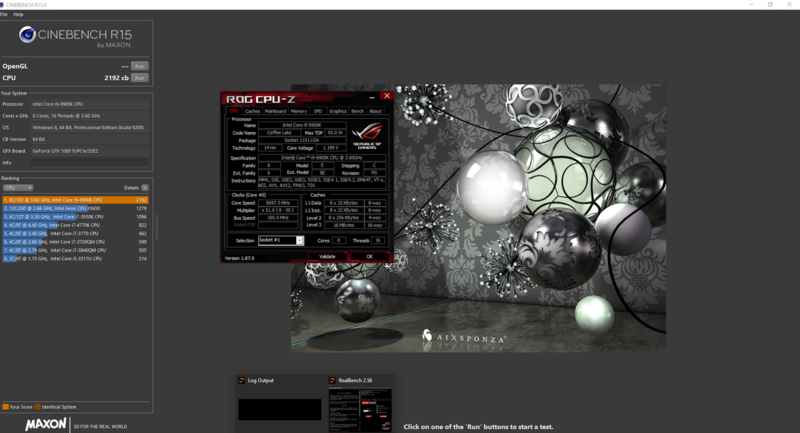 Max temp on lowest core 64c, highest core 70c. @Distracted. 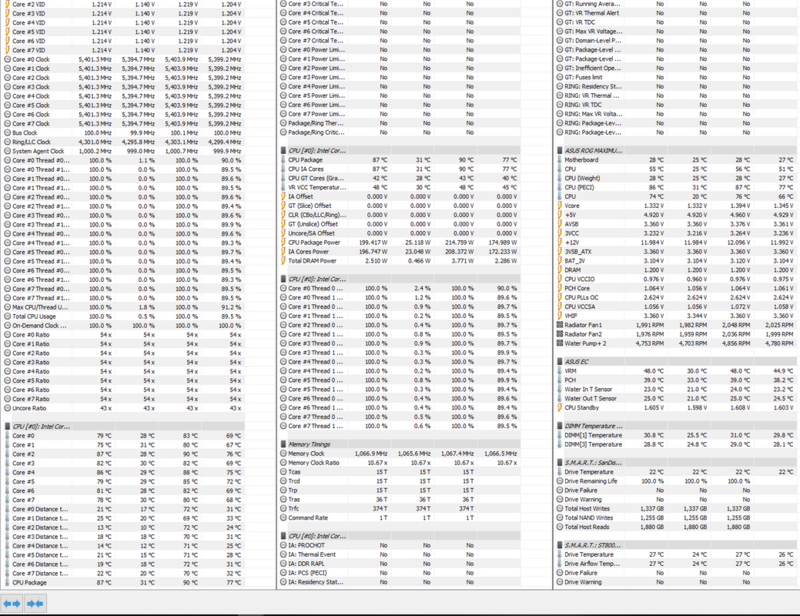 Cant see much in the way of numbers in your screenies, what are your Realbench temps like at 5.4ghz ? I've added a direct link to the full size screenshot - sry, I thought you could reach it from the image in the forums. If you follow the link and hit download original (if you want to) you can see the thing in full size and it is much clearer. I'm not sure why my images are all blurry. Very nice mate, keep an eye on your CPU Standby and CPU PLL's OC voltages. Once you go over the 52 multiplier these jump up considerably.